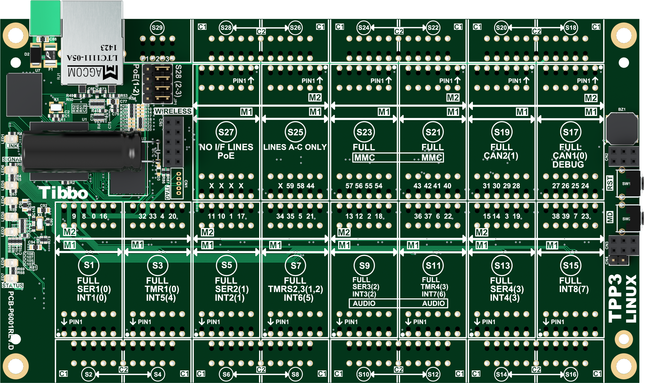 Size 3 Linux Tibbo Project PCB (LTPP3) comes preloaded with our own, highly polished distribution of Linux that is derived from the Red Hat line and is updated with the latest and greatest kernel and drivers. LTPP3 is ideal for applications that require no human-machine interface (HMI) while calling for a significant number of I/O lines and/or functions. Offering 7 tiles for a total of 14 "M" and 14 "C" sockets, the LTPP3 can be used to construct devices with up to four full serial ports, up to 26 relays, or up to 51 opto-inputs, PWM, or open-collector outputs. Further, the generous number of available Tibbit sockets means you can increase your system's versatility by offering multiple power supply options, such as +5V, +12V, PoE, etc. You can also install multiple power supply Tibbits to increase total available power or provide power redundancy. This product can be used as a bare board, or assembled into a size 3 Tibbo Project Box. •1GHz Cortex-A8 Sitara CPU from Texas Instruments. •Runs a fine-tuned Linux distribution (kernel 4.10). •Comes with Tibbo OS for Linux (LTiOS) and Node.js preinstalled. •10/100BaseT auto-MDIX Ethernet port (automatic detection of "straight" and "cross" cables). •Optional Wi-Fi interface (requires the GA1000 add-on module in the "L" modification). •Optional GPRS interface (requires Tibbit #47). - One of the UARTs works as a Linux console. - 1 module socket has PoE capability. •Up to 12 SPI or 13 I2C interfaces. •RTC with a backup supercapacitor. •2048-byte EEPROM for data storage. - Five blue LEDs (for Wi-Fi signal strength indication, etc.). •Automatic on-demand CPU speed throttling. •Reliable power-on/ brown-out reset circuit. •Power: 500mA @ 5V (100Base-T mode, full speed). •Dimensions (LxW): 165 x 94mm. •Operating temperature range: -40 ~ +70C. •Linux software and applications are upgradeable using the DNF system. •Tibbo BASIC/C application can be debugged through the Ethernet LAN. The board can be purchased with an Embedded AggreGate license. Serving as the board’s execution environment, AggreGate lends LTPP3 its immense power of data collection, processing, and visualization. Further, AggreGate provides a uniform, consists access to external data, devices, and systems using more than 100 supported communications protocols. Via a specially designed middleware C library, Embedded AggreGate is also able to access the board’s hardware resources, such as GPIO lines, serial ports, as well as Tibbit blocks installed in board’s sockets. LTPP3 comes with Node.js preinstalled. We are currently developing node.js modules for accessing the board's hardware resources and installed Tibbit blocks. You can also utilize many existing node.js modules, such as serialport and socket.io. Tibbo is currently porting its popular Tibbo OS (TiOS) to Linux. When this work is completed, you will be able to run TiOS as a Linux application and execute existing Tibbo BASIC and Tibbo C code with little or no modifications. Needless to say, the new LTPP3 board crunches Tibbo BASIC and C apps at unparalleled speeds. ... that comes in an attractive housing and may be extended with Tibbit blocks.